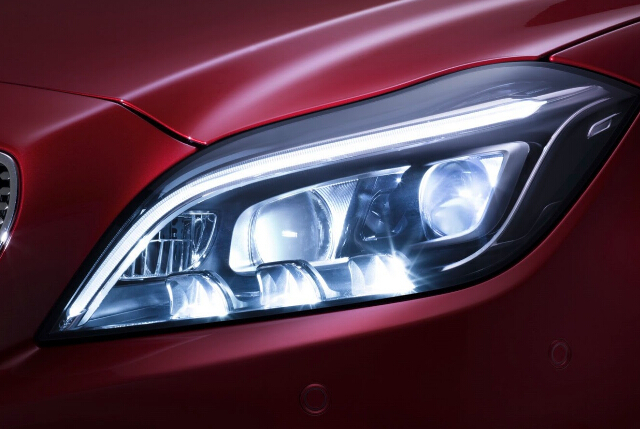 The new Mercedes-Benz CLS is equipped with multi-beam confirmation LED (MULTIBEAM LED) headlamps, have to be analogy, the principle of this headlight with Audi Matrix LED (Matrix LED) headlamps similar. It should be noted that this technique does not appear in the U.S. version of the CLS models, U.S. law must be independent of the vehicle high beam and low beam lights. For multiple light LED, using a plurality of LED modules Benz, each module comprising 24 separate LED light emission control unit. Collection of these separate high beam LED light beam from the beam, bright and uniform, but also by opening or closing part of the LED diodes to achieve beam bifurcation, local dimming and other effects, precise adjustment of the illumination area. Placed in the rear windscreen camera images collected at a frequency of 100 times per second to adjust the light intensity and angle, if the camera is detected in front of the curve, the lights will automatically deflected towards the direction of the curve, the maximum angle reached 12 °. 2015 Mercedes-Benz CLS in addition to the official map with new headlamps emphasize technology, will also be equipped with the new powertrain and matching 9G-TRONIC automatic transmission. Known to Nice Bottom new CLS will debut in October, with new headlamps fiddle Sao posture, For beautiful eyes gradually.